Let's walk in the woods until the ogres are there! After the phenomenal success of Fantasy, all the players were asking for a sequel! Well it's done, Sylvie Barc, prolific author of the first opus and Elixir, has concocted a magical and surprising Fantasy 2 for us! In the realm of forest creatures, nothing will be the same as before. Indeed, the small people of the forest see their universe disrupted by the arrival of 3 new factions: the Ogres, the Werows, but especially (and this is the worst), the Men who arrive at the right time to upset the precarious balance of the fairytale peoples. 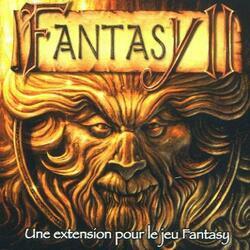 Fantasy 2 works according to the same principles as the basic game, but many new mechanisms and powers have been added to make the game more tactical. Be careful this game is an extension of Fantasy and cannot be played alone. To be able to play it you must have a copy of the game Fantasy . Contents of the box : 16 "Man" cards, 8 "Ogre" cards, 8 "Garou" cards, 14 Beer cards, 10 Secret cards, 1 game rule.